A Delhi court today remanded former Haryana minister Gopal Goyal Kanda in seven-day police custody following his dramatic surrender at 4 am in the Geetika Sharma suicide case. After evading arrest for several days, Kanda, who has been booked on abetment to suicide charges, reached the Ashok Vihar Police Station in a van, which had media stickers pasted on the front. 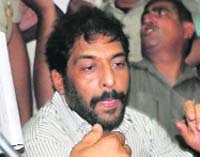 Gopal Kanda on the way to Rohini Court in New Delhi. Three reports of the Comptroller and Auditor General (CAG) estimate that private players gained a whopping Rs 3.82 lakh crore due to faulty government policies in captive coal mining, use of coal by private power generating firms and development of Indira Gandhi International Airport in public private partnership. The government auditor�s estimate of gain of Rs 1.86 lakh crore to private firms on the basis of direct allocation of captive coal blocks to them is primarily based on one premise � the screening committee tasked with awarding allocations did not do its job properly. The latest CAG report on the allotment of coal blocks has placed Prime Minister Manmohan Singh directly in the firing line of the Opposition and yet the Congress appears far more self-assured in dealing with this crisis as compared to the furore which erupted after the revelations on the allocation of 2G spectrum. Rattled by the triple whammy of the Comptroller and Auditor General�s (CAG) reports, the government has accused the auditor of not following its ascribed mandate and over-reaching it. Rejecting allegations, officials manning the Constitutional body say the financial scrutiny of the three subjects was very much part of its mandate because the task was assigned to it by the government itself. The bulk of the rumours that triggered panic among the people of the northeastern states in Karnataka, Tamil Nadu and Maharashtra were sourced from Pakistan, Union Home Secretary R K Singh said today. "A total of 76 websites were identified where morphed images were uploaded and bulk of these were uploaded in Pakistan," Singh told PTI. 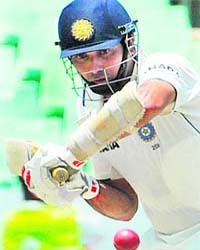 After 134 Tests, 8,781 runs at a striking average of 45.97, 17 timeless centuries and 56 half centuries, mostly in a rearguard action and shepherding tail-enders to memorable wins, 37 year old �Very Very Special� Laxman walked into the twilight of his cricketing career and announced his retirement from international cricket with immediate effect.